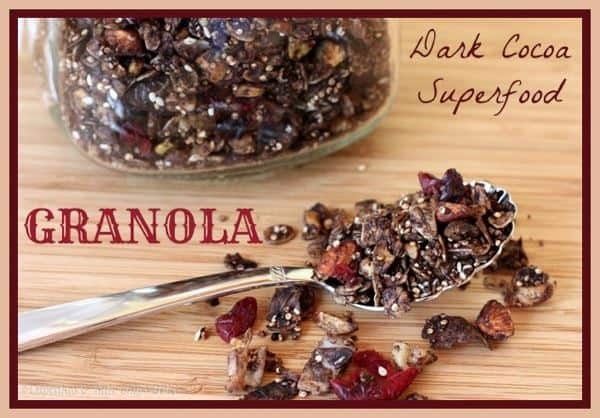 This Dark Cocoa Superfood Granola is packed with antioxidants, vitamins, minerals, healthy fats, and protein. Oh, and chocolate! 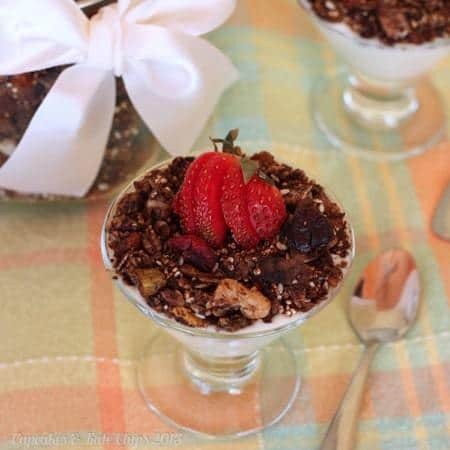 Dark cocoa for breakfast is good for you when you use it in healthy granola made with nuts, oats, quinoa, flax seeds and more. 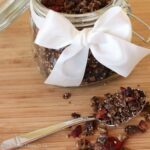 You’ll love this Dark Cocoa Superfood Granola recipe. Disclosure: This author received a free sample of walnuts from California Walnuts for sample and recipe development purposes only. All thoughts are my own. One thing I can say for sure, though – this Dark Cocoa Superfood Granola certainly is good for you. I mentioned yesterday that I was going to share some recipes this week for packing in the protein with Greek yogurt. Now, this isn’t a recipe with Greek yogurt in it, like yesterday’s Funky Monkey Smoothie, but it is certainly something I love to put ON my Chobani. The folks at California Walnuts contacted me about sampling some of their delicious nuts, and I was happy to take a bag off their hands and have a little fun. The walnuts are huge, fresh, and delicious. And sooo good for you – all those good fatty acids and omega-3s. They would be delicious on a salad, or mixed into Maple Pumpkin Spice or Banana Nut Bread Granola Bars. Or even into Maple Nutty Granola. And I know we are talking healthy here, but heck, throw them in some Snowball Cookies. After receiving the sample, I knew I wanted to make a new kind of granola. One that would make the most of all the nutritional benefits of the walnuts, especially when combined them with every other superfood I could find in my pantry. You know, like chocolate, in the form of dark cocoa powder. 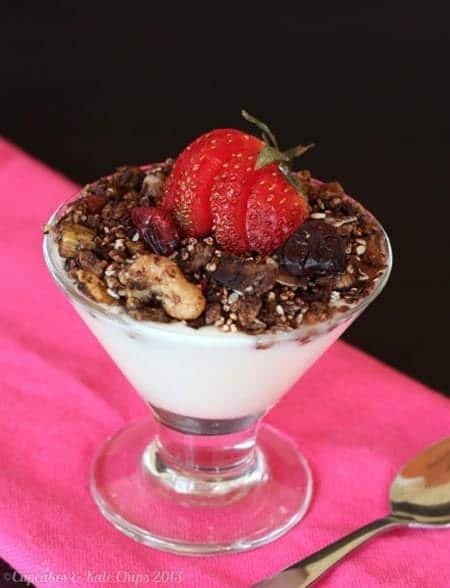 But I also added other goodness to truly make it a Dark Cocoa SUPERFOOD Granola. Things like oats, quinoa, flax seeds, chia seeds, pistachios, almonds, dried cranberries and blueberries, coconut oil, raw honey. Since I am pregnant, getting the most nutrition out of every bite I take is so key. That was my goal in making this granola – just keep packing in all the antioxidants, vitamins, minerals, healthy fats, and protein I could. And with these delicious California walnuts to start with, I knew it would turn out fabulous. Sure, you can buy tons of fancy granola in the store… and pay an arm and a leg for it. But often it is mostly oats or rice puffs or wheat flakes, loaded with unnecessary fat and sugar, and maybe you just don’t like raisins or peanuts, or some other ingredient. When you make it at home, you can control the quantity, quality, and types of ingredients. Like me – I love lots of nuts, and don’t want any wheat products in it, due to my allergy. So I wrote the recipe in a very flexible way. I’ll tell you what I did, but you can easily mix it up base don what you love. Or just what you can dig out of your kitchen cabinets. And while I often have this for dessert with my Chobani Greek yogurt (and oftentimes just by the handful), I can even feel good about letting The Bug eat something chocolaty for breakfast! 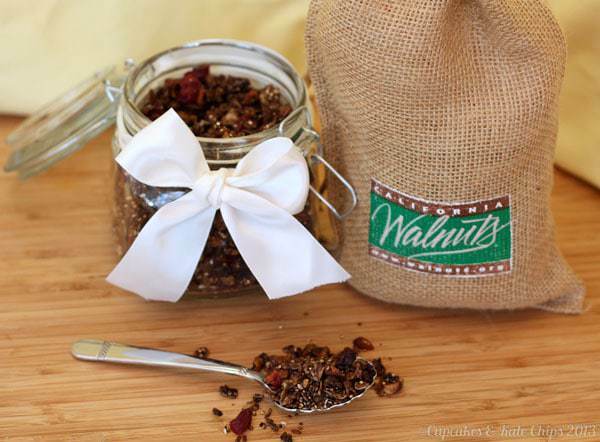 What is your favorite way to enjoy walnuts? In salads, granola, or just by the handful? In a small bowl, combine the Wet Mixture Ingredients. In a large bowl, combine the Dry Mixture Ingredients, EXCEPT the dried fruit. Bake for 1 to 1 1/2 hours, stirring every 20 minutes, or until dry. Brianne, this granola looks so good! These nuts look awesome!! I miss nuts, we avoid them because of our kids nut allergy. But got to keep the kids safe! 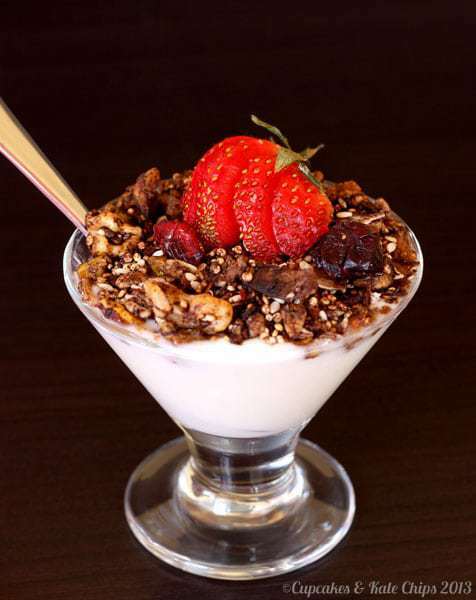 Your granola looks fantastic! Definitely gotta do what you have to for the little ones! But thanks! Thanks so much! It is quite tasty! And those walnuts are awesome. Just put some in a chicken salad tonight. 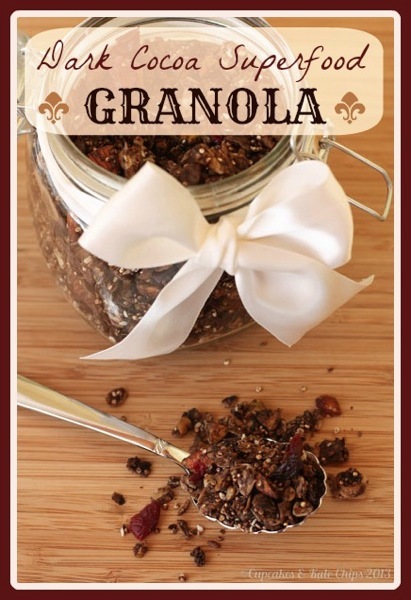 I am surprisingly crazy for granola, and I love the chocolate and all the goodness you put in this! I don’t make granola often because I actually tend to eat too much at a time. But this is sooo good! wow! 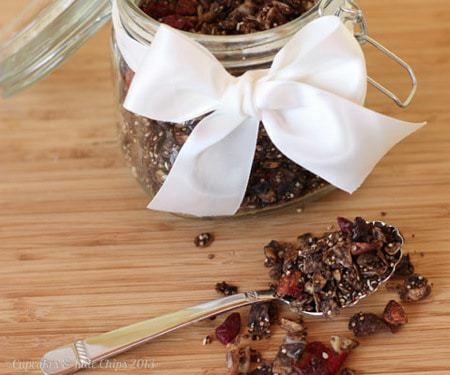 This is some great looking granola! I can totally get on board with this. Might have to whip it up sometime soon. Thanks! Anything chocolaty can’t be bad, right?